To get started, download RealVNC to the computer you want to control, install it, and choose a license. 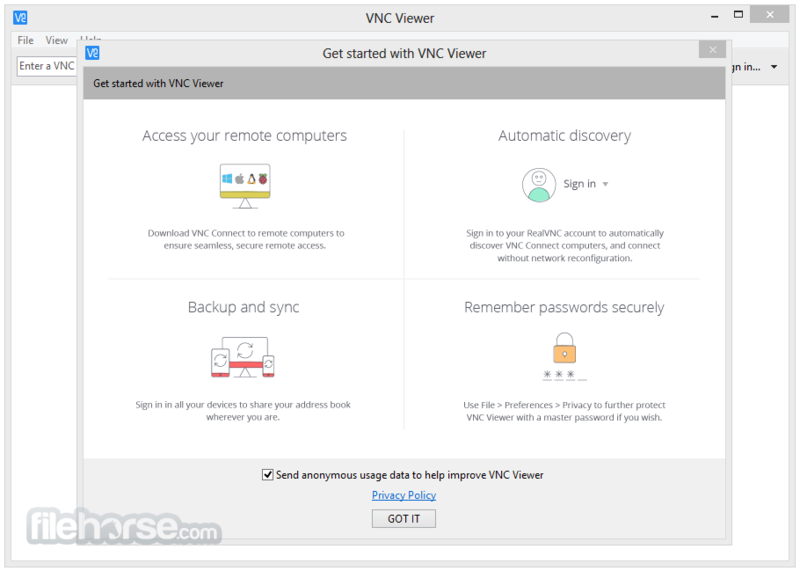 Then, download VNC Viewer to the computer you wish to exercise control from. Note if you are connecting over the Internet, you may also need to configure your network. Encrypt connections using 128-bit AES, for high performance encryption. This means that all data transmitted in either direction while connections are in progress—keystrokes and mouse movements made by users; screen captures sent back in order to display the desktop—are resistant to packet sniffing and tampering, man-in-the-middle attacks, and other malicious eavesdropping. Encrypt connections using ultra-secure 256-bit AES, for ultra-high performance encryption. This means that all data transmitted in either direction while connections are in progress—keystrokes and mouse movements made by users; screen captures sent back in order to display the desktop—are resistant to packet sniffing and tampering, man-in-the-middle attacks, and other malicious eavesdropping. Windows only (other platforms coming soon). Deploy, install, and license VNC on computers from a central location. Configure VNC from a management console (for example, to change authentication or encryption settings). Basic remote control for individual private use. Contains no session encryption and none of the premium features contained within Personal and Enterprise. Cross-platform remote control. VNC authentication.